Haig Construction successfully completed a tenant build-out involving multiple offices from framing to trim. Meeting a tight time schedule, they were fast and efficient with excellent attention to detail. I also appreciated the detailed job estimate, value-add ideas, and the honesty to credit us with savings they realized. 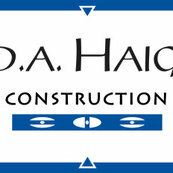 It is easy to highly recommend Haig Construction.